I don't have enough 18th century gowns. I have jackets and things, and I do love jackets, but when it comes to full gowns, I have, like, one (soon to be two). This gown will be "Robe Royaliste," if we were in France in 1790. Both the purple and the black were royalist colors, and add in a little green or yellow and the statement would be obvious! Journal des Luxus, April 1792. I adore this, the gown, the hat, the belt. I like the interesting combo of redingote and gathered front, like a gaulle. From Kyoto Costume Institute - not a fashion plate, but one of my favorite 1790s gowns, and would be a savvy design for what I'm thinking. George Romney Unknown lady, ca. 1786. - with the redingote collar and button cuffs. The front looks gathered...? A little earlier than my target dates. From LACMA, the back of their stunning 1790s redingote. I adore the huge mannish collar(s) on this one. 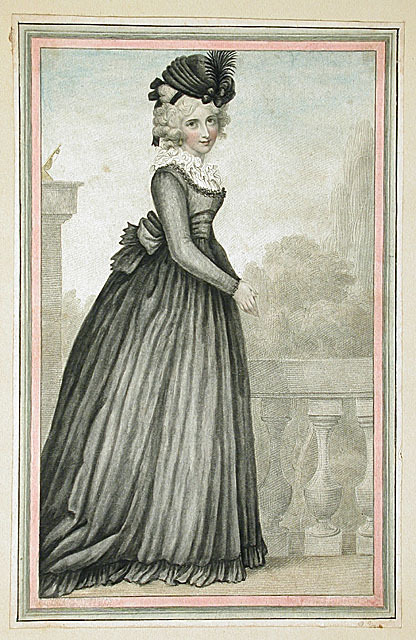 Marie Louise Elisabeth Vigée Le Brun. Marie-Louise of Bourbon-Sicily. 1790 . I like the idea of redingote details, but I want the skirt to be closed. The gathered-bust and long sleeve gaulle styles are also enticing, if the taffeta I bought will work that way. Is the bustline higher, perhaps empire? Or, is the sash that I am noticing? It looks like for the gathered front on the fashion plates the waist is tight, and then the poofs start at the bust, so it's kindof a midriff thing going on, if that makes sense? Love all the sashes, many thoughts now on what to do next to update my gown to go with red Kensington's. Oooooh that will be so pretty !!! I love the idea of a Robe Royaliste!!! One can never have too many gowns or jackets :D I can't wait to see what you make! Looking forward to seeing your project! I admit I'm rooting for seeing something gaulle-ish (not to be confused with Gaulish...ha!) as I've seen few recreations of these and would love to see your process with one! 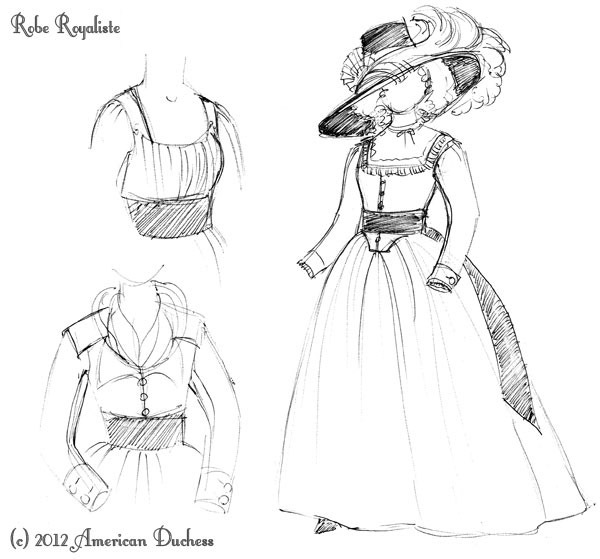 Love the lower bodice and full gown in your sketch! It may just be me, but I'm a sucker for buttons and a sash :) Can't wait to see what you come up with! Whatever it is I'm sure it will be gorgeous. You're right, a girl can never have enough gowns....I'm working on my first 18th C gown right now, with more to follow!! You might have already seen this blogger, but the Kyoto Institute dress you posted reminded me of this dress she made.